New Delhi: The Prime Minister, Shri Narendra Modi, today chaired his twentieth interaction through PRAGATI – the ICT-based, multi-modal platform for Pro-Active Governance and Timely Implementation. 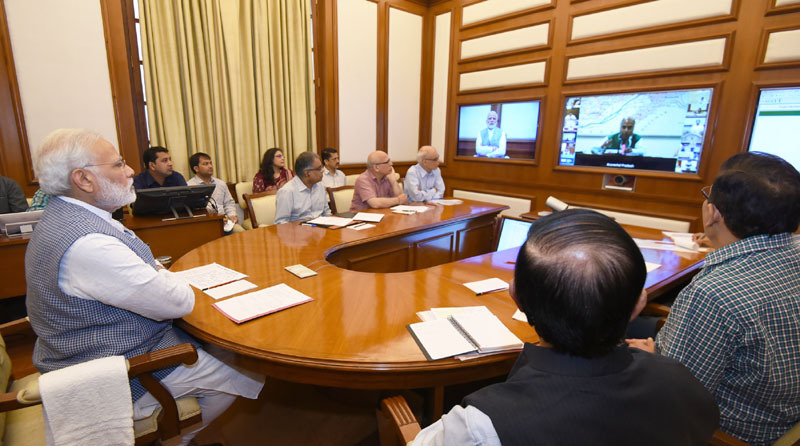 The Prime Minister began the meeting with a review of the situation arising out of flood and other natural calamities in the North-Eastern States. He assured the States of all possible help from the Centre. The Prime Minister urged all Chief Secretaries to work expeditiously towards ensuring that all traders register under the GST regime, and this task is completed before August 15th. The Prime Minister reviewed the progress towards handling and resolution of grievances related to CPWD, and Directorate of Estates. He asked the Ministry of Urban Development to proactively monitor the same, with sensitivity. He urged CPWD to encourage all vendors to come aboard the Government e-Marketplace (GeM) platform. The Prime Minister reviewed the progress of vital and long-pending infrastructure projects in the railway, road and petroleum sectors, spread over several states including Maharashtra, Karnataka, Andhra Pradesh, Tamil Nadu, West Bengal, Odisha, Uttar Pradesh, Uttarakhand, Himachal Pradesh, and Arunachal Pradesh. The projects reviewed today, include the Chennai Beach-Korukkupet third line and the Chennai Beach-Attippattu fourth line; the Howrah-Amta-Champadanga new Broad Gauge line; and four-laning of Varanasi bypass; four-laning of Muzaffarnagar-Haridwar section of NH-58. Noting that several of the projects reviewed today have been pending for decades, and in one case, over four decades, the Prime Minister urged all Chief Secretaries to take all possible steps to avoid delays, and resulting cost escalations. He emphasized on speedy implementation of such infrastructure projects. The Prime Minister reviewed the progress of the Pradhan Mantri Awas Yojana (Urban). He urged the concerned departments to accelerate the adoption of new construction technologies at the earliest.